Please be patient, some games take longer to load than others! 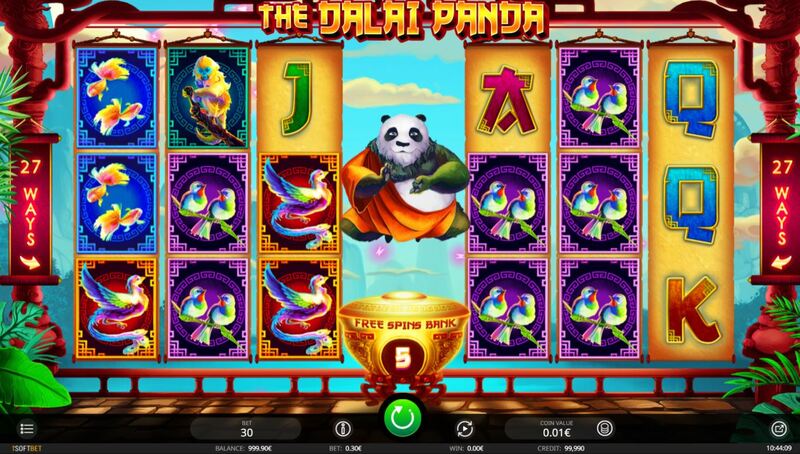 The Dalai Panda slot certainly makes an impression when you open it for the first time with its unusual and distinctive reels configuration. Another bonus is the fact the graphics aren't too juvenile unlike other Panda games such as Nextgen's Pandamania or Lightning Box's Panda Pow but if you like real Panda images then Microgaming's Untamed Giant Panda would be the best choice. We play to a soundtrack of the inevitable Oriental music which is nice and gentle with a soft swooshing sound as the reels stop, although the music increases in volume and drama when a win appears! Apparently the word 'Dalai' was originally Mongolian and meant 'big' so will this Panda mean a big dent or addition for our bankroll? The first thing you'll have noticed here aside from stacked symbols is the fact we have 2 grids of 3 reels and 3 rows with our Dalai Panda sitting in between over his bowl of wishes. These grids are both all-ways and thus pay 27 ways each but that can change as we'll discover. 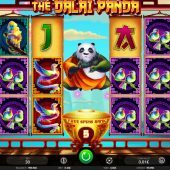 We pay 30-coins per play and if I list the pays as both 3-of-a-kind and 6 you'll probably see what the Dalai Panda can do here - sometimes! The Peacock awards 500/50 coins for a 6/3-of-a-kind win, Monkey 350/40, Turtles 250/30, Songbirds 200/20 and Goldfish 150/20. There are four card values awarding 100 down to 40 coins for 6 and 10 or 5 coins for 3. The real fun starts with our cuddly black-and-white bear though! On any spin the Panda may rise up in a dramatic clash of cymbals and throw some randomly-placed Bamboo Wilds on the grid, usually 2 or 3. This can be useful as underneath him his Bowl of Wishes has 5 free games in it and every time a win appears on both grids in the same spin this number rises by 1. He may also appear after a spin where you you have a win on one grid and make the game 729-ways by joining the grids and maybe linking symbols on both to make 4, 5 or 6-of-a-kind wins. The right-hand grid pays right-to-left by the way to make this possible from either side. This is one clever Panda! If you see 3 or more bonus scatters anywhere in view over both grids you will then be awarded the free games total collected in the Dalai Panda's Bowl Of Wishes. You can get retriggers for 3 or more scatters (at pay table amounts of spins not the total you began with) and 2 extra spins for 2 scatters too. Needless to say the Panda is munificent during them as he will make every spin a 729-way grid and on each spin throw in some goodies!